Since your credit card data won't be processed directly by us, we will never get any of your personal credit card details. You can better understand how it works by looking at the diagram, where it is explained how all payments are going to be managed. The first step takes place in our website. 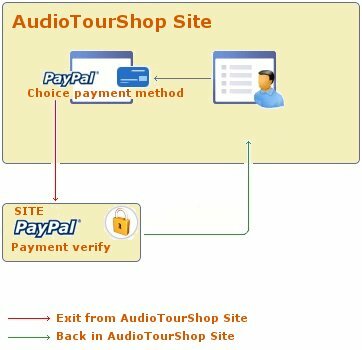 Here you can look for the most suitable mp3 audio tour or audio guides you wish to order, add them to the cart and choose the method of payment. In our diagram it corresponds to the blue arrow. By choosing a payment through paypal or credit card you will temporarily leave our website, (in our diagram it corresponds to the red arrow) and enter the Paypal website, where your credit card details will be entered. When you log in to Paypal site, they verify that your internet browser is running Secure Sockets Layer 3.0 (SSL) or higher. Information is protected by SSL with an encryption key length of 168 bits (the highest level commercially available). Once the payment process will be completed, Paypal will only confirm us nothing other than the outcome of the payment. For more information, please visit Paypal website. Once the payment process is completed, you will get back to our website, where an order confirmation page will appear (in our diagram it corresponds to the green arrow).